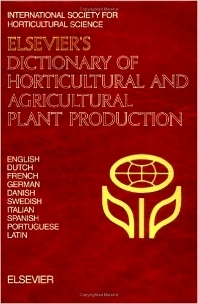 The first edition of this dictionary, Elsevier's Dictionary of Horticulture, edited by J. Nydam and A. de Jong was published in 1970. Since that time horticulture has expanded and developed spectacularly and the aim of this second edition is to meet a worldwide need to develop close contacts and to keep up with the developments in the horticultural world. Numerous terms have been introduced, covering a far broader field than the previous dictionary. Again English was chosen as the basic language and Portuguese has been added with Latin for the scientific names of organisms. Apart from the traditional subjects like vegetables, fruits, arboriculture, floriculture, mushrooms, crop science, plant breeding, botany and soil science, it now also includes tropical and subtropical horticulture, herbs and spices, landscaping, arable farming and grasses. More attention has been paid to market planning, economics, education, and extension and labour management. A number of terms relating to apiculture, meteorology and informatics have been introduced. Technology has been given more prominence, but so many new terms have been coined in this field that a selection had to be made. Regarding plant diseases, only general terms are mentioned; specific pests and diseases are not listed in view of the existence of specialized dictionaries. The same goes for weeds. A list of international organizations is included, with translations in English and French.